Azerbaijan or Azarbaijan (Persian: آذربایجان‎ Āzarbāijān [ɒːzærbɒjdʒɒːn];[lacks stress] Azerbaijani: آذربایجان‎ Azərbaycan [ɑzærbɑjdʒɑn]),[lacks stress] also known as Iranian Azerbaijan, is a historical region in northwestern Iran that borders Iraq, Turkey, the Nakhchivan Autonomous Republic, Armenia, and the Republic of Azerbaijan. Iranian Azerbaijan is administratively divided into West Azerbaijan, East Azerbaijan, Ardabil, and Zanjan provinces. The region is mostly populated by Azeris, with minority populations of Kurds, Armenians, Tats, Talysh, Assyrians and Persians. Mugan plain (Azeri: موغان دوزی), is a plain in northwestern Iran and the southern part of the Republic of Azerbaijan. The highest density of irrigation canals is in the section of the Mugan plain which lies in the Republic of Azerbaijan. It is located on the bank of the Aras river extending to Iran. It contains highest density of irrigation canals is in the Mugan plain. 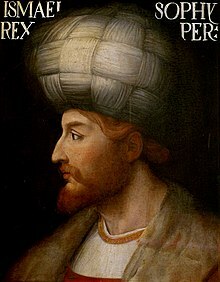 Shah Ismail Khatāī (July 17, 1487 Ardabil – May 23, 1524 Tabriz), known in Persian as Shāh Ismāʿil full name: Abū l-Muzaffar bin Haydar as-Safavī, was a Shah of Azerbaijan (1501) and the founder of the Safavid dynasty which survived until 1736. Isma'il started his campaign in Iranian Azerbaijan in 1500 as the leader of the Safaviyya, a Twelver Shia militant religious order, and unified all of Iran by 1509. Born in Ardabil in Northwestern Iran, he reigned as Shah Ismail I of Iran from 1501 to 1524. Ismail was also a prolific poet who, under the pen name Khatā'ī ("Sinner") contributed greatly to the literary development of the Azerbaijani language. 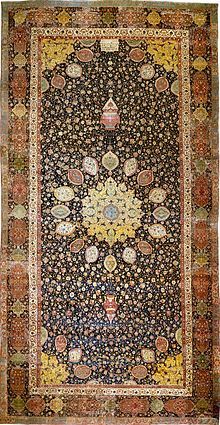 The Ardabil Carpet is either of a pair of two famous Iranian carpets in the collections of the Victoria and Albert Museum in London and the Los Angeles County Museum of Art. Seyyed Mohammad Hossein Behjat Tabrizi (Persian: سید محمدحسین بهجت تبریزی‎) (1906 – September 18, 1988), mainly known by his pen name, Shahriar(Persian: شهریار‎) (), was a notable Iranian poet, who wrote in Azerbaijani and Persian. His most important work Heydar Babaya Salam is considered to be the pinnacle in Azerbaijani literature which gained great popularity in the Turkic world and was translated to more than 30 languages. Hadi Saei born June 10, 1976 in Rey, Iran) is a former Iranian Azeris Taekwondo athlete who became the most successful Iranian athlete in Olympic history after winning gold in the 2008 Summer Olympics. He competed in the Men's 68 kg (featherweight) at the 2004 Summer Olympics and won the gold medal. In addition, he competed in the Men's 80 kg at the 2008 Summer Olympics and won his second olympic gold. Earlier in his career and in the 2000 Summer Olympics in Sydney, Saei had won the bronze medal. Bazaar of Tabriz (Azerbaijani تبریز بازاری, Tabriz Bāzāri) is a historical market situated in the middle of Tabriz, Iran. It is one of the oldest bazaars in the Middle East and the largest covered bazaar in the world and is the largest closed one-roofed structure in the world, and is one of Iran's UNESCO World Heritage Sites. Ashik (Azerbaijani: عاشیق), is a mystic bard, balladeer, or troubadour who accompanied his song—be it a hikaye (Persian: dastan, a traditional epic or a romantic tale) or a shorter original composition—with a long necked lute (saz). The modern Azerbaijani ashiq is a professional musician who usually serves an apprenticeship, masters playing saz, and builds up a varied but individual repertoire of Turkic folk songs. Azerbaijani style is a style (sabk) of architecture when categorizing Iranian architecture development in history. Landmarks of this style of architecture span from the late 13th century (Ilkhanate) to the appearance of the Safavid Dynasty in the 16th century CE. Did you know that nickname of Tabriz is City of Firsts ? Did you know that Nine historical sites in Azerbaijan have been designated as World Heritage Sites by UNESCO ? Did you know that Urmia Lake is second Salt lake in World ? Did you know that Ali Javan co-invented the gas laser in 1960? Did you know that Iran crisis of 1946 formation and destruction Azerbaijan People's Government by leadership of Ja'far Pishevari was in the years (1945 — 1946) in the Iranian Azerbaijan ? Did you know that Jabbar Baghtcheban was founder of the first kindergarten, the first school for deaf and Lalhay in Iran ? Did you know that Hassan Roshdieh that has father of Iran's new culture nickname, instead of going to Najaf and reading religious lessons, go to Istanbul, Egypt and Beirut, to learn new teacher ?